Depending on where you live, you have either started or getting ready to start seeds for this year’s garden. There is a lot of information available on how to start seeds indoors. A quick Google search comes up with over 600,000 references on how to start seeds indoors. So you can get the basics through a quick search. Today’s blog will be about what we have learned. What has worked and provided success for our seed starting. Here are some things we have learned over the years about stating seeds indoors. 1. Resist starting too early – Use the “last frost” date as a guide. A quick check of the Farmer’s Almanac (Canada, US) will present the last frost date for your part of the world. In our case, around May 20th would be the ”last frost date”. Using May 20th as our guide, we check journal entries for previous years and determine a planting date. The planting date is when the seedlings go in the ground or other seeds are direct sown. For seedlings, it is important to account for “hardening off” in your calculations (7-10 days). More important than frost date is the soil temperature. For most of the last 5 years the soil temperature becomes suitable for transplanting May 24th to June 1st. If you use the Garden Planer print out the planting guide for the garden you designed. 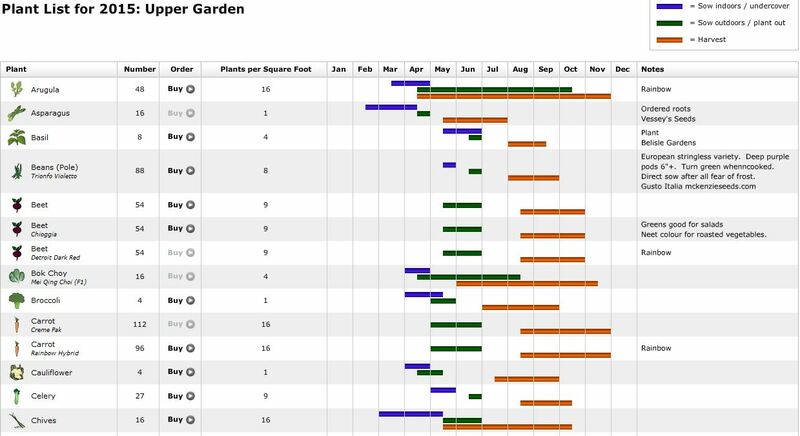 A Gantt chart showing starting dates, planting dates and harvest dates is produced to guide you through the garden season. You can download a Seed Starting Planner from The Organic Gardener website to help in your planning. Example: Roma Tomatoes: Start 6-8 weeks before last frost date May 20th. (March 25th – April 8th) Planting date of June 1st less 8-10 days hardening off, puts us at May 23rd to May 25th. So anytime between March 25th to April 8th works for us based on the Farmers Almanac, our set out dates of past years, and our recorded soil temperatures the last five years. 2. Keeping good records gives confidence in your planting! 3. Starting containers – Almost any container can be used to start seeds. Be sure they are clean by washing in soap and water and rinsing in a mild bleach solution. Provide some drainage to the bottom and place in waterproof trays. This allows for bottom watering. 4.Bottom watering will increase your success in starting seeds. We have always used biodegradable peat pots for containers and black plastic trays designed for seed starting. If you want to make your own, here are 7 DIY Seed Pots you can make. 5. Quality Starter Mix – Use a quality seed starter mix. A soiless mix, usually a combination of peat moss and vermiculite is best. We avoid starting mixes that are “pre-fertilized” preferring to use organic fertilizers latter. You can also make your own starter mix and take complete control. 6. Carefully sow seed – Sow what you need. If you plan on four pepper plants in your garden, then sow 8 seeds, two per container. At a low 50% germination , you will have your four pepper plants and maybe some extras for your friends. Make sure the grow mix is moist and sow seed according to the instructions on the package. Seed depth is important. Usually the seed is sown to a depth of three times it’s size. Place seeds carefully on the surface of the mix and sprinkle an appropriate amount of mix on top of the seed. Sow 3 to 4 seeds per pot and thin to 2 or 3 after germination if needed. Cover the seeded tray with sheet of plastic, saran wrap or plastic dome. You will eventually move each seeding to a lager pot. We have found that cucumbers are an exception as they do not like being disturbed too much. We start cucumbers in larger bio-degradable pots to avoid over handling and transplant directly to the garden. 7. Warmth is Important – Bottom heat is needed for good seed germination. You can provide for warmth by using a heating pad designed for seed starting, placing trays on top of your fridge, or a space heater set up to give warmth to the bottom of the trays. If you have heated floors in your house lay your trays out and watch your step! You will have results without the bottom warmth, but you will have better results with bottom warmth. Once the seeds have germinated, remove from heat source. Seedlings do not need the same warmth. Be sure to maintain a moist soil and be careful not to over water. 8. Use artificial light – Once germinated the seedlings will need lots of light. The seedlings will fight for light and reach out for it. Seedlings will become weak and spindly without an adequate light source. Use an artificial light source (fluorescent) hung just above the seedlings, raise the light as the seedlings grow and provide light for about sixteen hours a day. 9. Feed the seedlings – After the seedlings have the first true leaves use a weak solution (1/4 of normal) organic fertilizer (compost tea, fish emulsion and seaweed extract) every 1-2 weeks until they’re ready for planting out. 10. Get a Fan – After transplanting seedlings to larger pots, place a fan to blow gently over the seedlings through the day. This will help develop a stronger and hardier plant. You can gently brush your hand over the seedlings a couple times a day as well. 11. Be ruthless – Thin your seedlings to allow only the strongest and healthiest to continue. 12. Be patient – Check the germination trays and the seedlings each day. Also if you do not have a heated green house to accommodate starting your own seeds, be prepared to have your home taken over. for a couple of months! Starting your own seeds is not difficult, but requires planning, a methodical approach, patience and TLC. Remember to make journal entries of your seed starting experiences. Share the magic with others in your household. Involve children is the garden cycle from the beginning. Allow them to start their own seeds for their own garden and provide the care needed. The rewards are well worth the effort when you bite into a sun drenched Big Beef Tomato that you started as a tiny seed in April. You also know the source of the food you eat and know how it was grown. Time to prepare the soil mix and fill some pots.